Tom Brady’s potential suspension was no deterrent for eXpertLeagues.com’s Steve Parsons, buying the New England quarterback for $26. This 12-team league follows the PPR rules and scoring system of a basic CBS league. Unfortunately, the league site is not available for public viewing, but the complete draft results are listed below. We do award 6 points per passing TD, so a good strategy is to look at the elite QBs and try and pounce on one at a decent price. 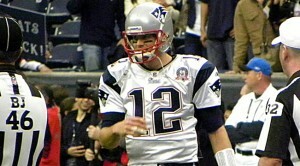 Tom Brady fit the bill for eXpertLeagues.com’s Steve Parsons. Elite RBs tend to go foe $55+, but this time around, Matt Forte at $40 and LeSean McCoy at $29 were good prices. Enjoy perusing the team-by-team draft results below, and look at the comments for this post for more thoughts from the auction participants themselves.